in it. 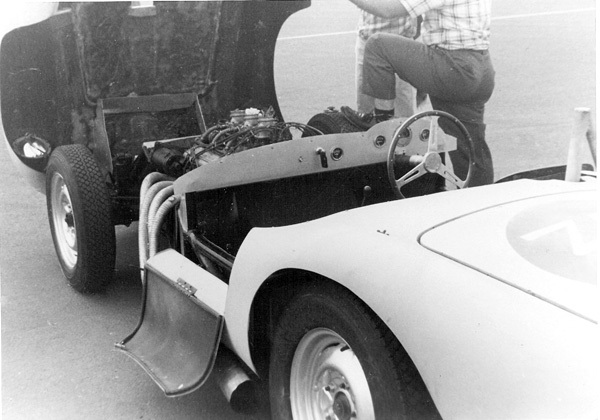 Since the Porsche 550 and RSK were the cars to beat, the DeMar was designed to be a Porsche with about the same weight, more power, and the same weight distribution. It was designed to utilize a Porsche trailing arm front suspension with a Porsche trailing arm low-pivot swing axle in the rear with a very lightweight deep truss frame connecting everything and a "lightweight" Chevy Engine for power. The Porsche was about 47% front and 53% rear and the DeMar war 50% front 50% rear, with a 94" wheelbase. The motor was set back so far that the vibration damper was just behind the front axles, the Jaguar transmission was bolted directly to the '48 Ford differential. An engine speed driveshaft connected it. Jaguar disc brakes with parking brake pads were mounted to the Ford differential and the low pivot swing axle tubes directly below it. The Porsche front trailing arms and cross torsion bars were mounted to the very lightweight 12 inch deep truss frame in front, and the Porsche trailing arms with coil over shocks at the rear. I wanted to outdo the Porsche which in 1957 was for practical purposes "King of the mountain". It certainly did that." More from Jack Stewart: "In 1959 you could rent Willow Springs race track for $5.00 per day. You went to the X motel in Lancaster (I believe) and got the key to the padlock and the track was yours "as is". No turn markers, water, or anything. This presented some challenges as it was easy to misjudge your speed entering a turn, as I did. The black track can be seen several hundred yards in the background. When it was apparent that I could not make the turn I drove straight off the drop off ( thus the severe toe-out) rather than risk rolling in the sand. The plowed furrow that I wound up in circled the track to try and stop people from coming in from the desert and not paying the $5.00. We left to move to New Jersey the next day so I could not check it. On the way we stopped in Cincinnati for two weeks. We checked without tearing anything open and all seemed well, except the car was not responding, no miss or anything. We ran the Bellefontaine hillclimb setting an all time record, but it still did not feel good. Finally after we got to New Jersey and tore the engine down we found a rocker arm with the valve stem punched through it; it was as neat as if it had been machined. This valve was opening a little bit because the rocker was pushing on the valve keeper which fortunately stayed in place."